Fred Soll's Frankincense & Myrrh Classic - Truly for the connoisseur, this classic fragrance blend is made solely from pure Frankincense & Myrrh resins. A combination you are sure to enjoy. This product is not intended to diagnose, treat, cure or prevent any disease; the law applicable to dietary supplements, the Dietary Supplement Health and Education Act of 1994, commonly referred to as DSHEA, does not permit us to do so and it is not our intention to do so. The Contraindications and Potential Drug Interactions information provided on this website is not intended to be all-inclusive. Keep your healthcare provider informed about any herbal and other dietary supplement products that you are taking. Frankincense & Sandalwood - May this Frankincense and Sandalwood bless you. May it keep your spirit happy and creative. Fred Soll's Frankincense and Sandalwood is made from chunk frankincense resin, pure essential oil, and sandalwood powder. This product is not intended to diagnose, treat, cure or prevent any disease; the law applicable to dietary supplements, the Dietary Supplement Health and Education Act of 1994, commonly referred to as DSHEA, does not permit us to do so and it is not our intention to do so. The Contraindications and Potential Drug Interactions information provided on this website is not intended to be all-inclusive. Keep your healthcare provider informed about any herbal and other dietary supplement products that you are taking. Pinon Incense - The Pinon tree, native to New Mexico, was the inspiration for this truly refreshing fragrance from Fred Soll's. Light one and enjoy the enchanting New Mexico forest. Moonlight Jasmine - Fred Soll's Moonlight Jasmine is the perfect companion for day or night dreaming. Enjoy the bouquet, hear the love and feel the lure of Moonlight Jasmine. Moonlight Jasmine cones are made from Pinon resin, pure essential oils, and floral powders. This product is not intended to diagnose, treat, cure or prevent any disease; the law applicable to dietary supplements, the Dietary Supplement Health and Education Act of 1994, commonly referred to as DSHEA, does not permit us to do so and it is not our intention to do so. The Contraindications and Potential Drug Interactions information provided on this website is not intended to be all-inclusive. Keep your healthcare provider informed about any herbal and other dietary supplement products that you are taking. Lovely Lavender - Fred Soll's genteel Lovely Lavender incense cultivates peace of mind, tranquility and harmony. Lavender is Love. Lovely Lavender is made with Pinon and other pure resins, essential oils and floral powders. This product is not intended to diagnose, treat, cure or prevent any disease; the law applicable to dietary supplements, the Dietary Supplement Health and Education Act of 1994, commonly referred to as DSHEA, does not permit us to do so and it is not our intention to do so. The Contraindications and Potential Drug Interactions information provided on this website is not intended to be all-inclusive. Keep your healthcare provider informed about any herbal and other dietary supplement products that you are taking. Sage & Cedar - As the Native American Ancient Blend, Fred Soll's Sage and Cedar cones are made from natural pinon resin, pure essential oils, Sacred Sage and Cedar Powder. May this blend purify and heal you, giving you prosperity and longevity. Egyptian Musk - For centuries the legend of Egyptian Musk has symbolized sensuality and is considered an aphrodisiac. 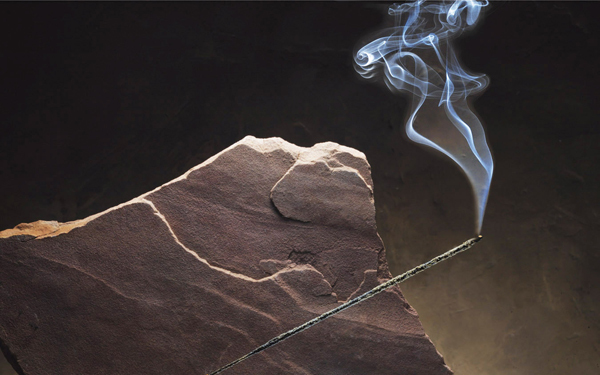 Grasp the feeling of the moment as the Egyptian Musk incense glows. Fred Soll's Egyptian Musk incense is made of Pinon and other pure resins, essential oils and floral powders. This product is not intended to diagnose, treat, cure or prevent any disease; the law applicable to dietary supplements, the Dietary Supplement Health and Education Act of 1994, commonly referred to as DSHEA, does not permit us to do so and it is not our intention to do so. The Contraindications and Potential Drug Interactions information provided on this website is not intended to be all-inclusive. Keep your healthcare provider informed about any herbal and other dietary supplement products that you are taking. Lavender and Sage - To create this interesting scent, Fred Soll's combined their most popular Sacred Sage with our very romantic Lovely Lavender. Their Lavender & Sage is made with Pinon resin, pure essential oils, floral and herbal powders. This product is not intended to diagnose, treat, cure or prevent any disease; the law applicable to dietary supplements, the Dietary Supplement Health and Education Act of 1994, commonly referred to as DSHEA, does not permit us to do so and it is not our intention to do so. The Contraindications and Potential Drug Interactions information provided on this website is not intended to be all-inclusive. Keep your healthcare provider informed about any herbal and other dietary supplement products that you are taking. White Sage & Dragon's Blood - Here we have created the ultimate protection combination. Fred Soll's White Sage and Dragon's Blood is made from pure White Sage essential oil, Dragon's Blood resin, and White Sage herb. Sacred Sage - Sage is burned to detoxify your environment. It is used by the wise. Fred Soll's Sacred Sage is made from pure pinon resin, natural essential oils and white sage. This product is not intended to diagnose, treat, cure or prevent any disease; the law applicable to dietary supplements, the Dietary Supplement Health and Education Act of 1994, commonly referred to as DSHEA, does not permit us to do so and it is not our intention to do so. The Contraindications and Potential Drug Interactions information provided on this website is not intended to be all-inclusive. Keep your healthcare provider informed about any herbal and other dietary supplement products that you are taking. Fresh Peaches - Fred Soll uses only all-natural ingredients to produce his high-quality incense products. Made with all-natural resin, Fred Soll's incense is handmade, hand dipped, and dried in the New Mexico Sun. This product is not intended to diagnose, treat, cure or prevent any disease; the law applicable to dietary supplements, the Dietary Supplement Health and Education Act of 1994, commonly referred to as DSHEA, does not permit us to do so and it is not our intention to do so. The Contraindications and Potential Drug Interactions information provided on this website is not intended to be all-inclusive. Keep your healthcare provider informed about any herbal and other dietary supplement products that you are taking. Fred Soll's Joyous Rose - Made for his true love, Joy, this all-natural aroma will delight your senses. It's mellow and soft blend will definitely put you in the mood for love. Joyous Rose is made with pure Pinon resin, natural essential oils and floral powders. Ancient Blend Frankincense and Myrrh. The gift of an ancient offering, Fred Soll's has created an earthy blend of pure resins that are sure to please the connoisseur. Light a stick and enjoy this divine aroma.Warnings & Disclaimers: Caution: As with any dietary or herbal supplement, you should advise your health care practitioner of the use of this product. If you are nursing, pregnant, or considering pregnancy, you should consult your health care practitioner prior to using this product. This product is not intended to diagnose, treat, cure or prevent any disease; the law applicable to dietary supplements, the Dietary Supplement Health and Education Act of 1994, commonly referred to as DSHEA, does not permit us to do so and it is not our intention to do so. The Contraindications and Potential Drug Interactions information provided on this website is not intended to be all-inclusive. Keep your healthcare provider informed about any herbal and other dietary supplement products that you are taking. Spicy Cinnamon - The flavorful aroma of Cinnamon encourages clarity of our natural psychic ability to protect money and all manifestations of the material plane. Please enjoy Fred Soll's cinnamon sticks and cones, made with pure cinnamon, all natural resins and pure essential oils. May this Frankincense with Roses and Jasmine bless you. May it keep your spirit happy and creative. Fred Soll’s Frankincense with Roses and Jasmine is made with chunk frankincense resin and rose petals. Warnings & Disclaimers: Caution: As with any dietary or herbal supplement, you should advise your health care practitioner of the use of this product. If you are nursing, pregnant, or considering pregnancy, you should consult your health care practitioner prior to using this product. This product is not intended to diagnose, treat, cure or prevent any disease; the law applicable to dietary supplements, the Dietary Supplement Health and Education Act of 1994, commonly referred to as DSHEA, does not permit us to do so and it is not our intention to do so. The Contraindications and Potential Drug Interactions information provided on this website is not intended to be all-inclusive. Keep your healthcare provider informed about any herbal and other dietary supplement products that you are taking. Please enjoy this pure resin Frankincense and Myrrh with Cinnamon. Warnings & Disclaimers: Caution: As with any dietary or herbal supplement, you should advise your health care practitioner of the use of this product. If you are nursing, pregnant, or considering pregnancy, you should consult your health care practitioner prior to using this product. This product is not intended to diagnose, treat, cure or prevent any disease; the law applicable to dietary supplements, the Dietary Supplement Health and Education Act of 1994, commonly referred to as DSHEA, does not permit us to do so and it is not our intention to do so. The Contraindications and Potential Drug Interactions information provided on this website is not intended to be all-inclusive. Keep your healthcare provider informed about any herbal and other dietary supplement products that you are taking. Fred Soll’s Frankincense and Myrrh with Sacred Sage is made with frankincense and myrrh pure resin, sacred sage oils and powders. Let us open up our hearts and embrace this vibration. Fred Soll's Sweetgrass incense is made from chunk resin and sweetgrass.